There's a certain category of trailer that I don't have a good name for yet, but for a long time I've unfairly referred to them as "Star Wars Trailers." These are the trailers which seem to know that it doesn't matter how they're edited; people will get hyped because they're dying to see something, ANYTHING from the film or game. This is not to say that all Star Wars trailers are bad; I enjoyed the Phantom Menace trailers and those for The Force Awakens and on (Yes, that's throwing shade at most of the trailers for Episode II & III). In some of these cases, the trailer producers take that liquid gold material, and make something incredible! In other cases they make something that ticks all the checkboxes for the marketing brief, but end up with something I find flat and uninteresting. Sometimes they even get lauded as great trailers or put on top ten lists, and I just think to myself: "Really?" Seriously, the Phantom Menace trailer could've been just this shot and a title card. I was going to write a longer list, but after I typed those two things, I realized that's all I need; flashy sound design, and motion graphics just add flair. From the title of this post, you can probably guess that this is going to be about Harry Potter, specifically the first full trailer for Harry Potter and the Sorcerer's Stone (the second trailer was structurally very similar with some shots swapped out here and there). Why am I not writing about a Star Wars trailer? No particular reason; I may write a future post deconstructing the Star Wars prequel trailers I feel fit this category. If you're a Harry Potter fan, or have any familiarity, try to watch this trailer from the perspective of someone who knows absolutely nothing about Harry Potter. If you actually know nothing about Harry Potter, then this will be very easy for you. Pay particular attention to the music while watching, or watch it once, and then watch it again paying attention to the music. The trailer starts off with the now-iconic John Williams Harry Potter theme. This is one of the only times where the music is the focus; it's a great theme, so it's a good way to start the trailer even if the audience hasn't heard it before. The first shots are teaser-like with shots of an owl, elf-like people and a city area. "Did you ever make anything happen? Anything you couldn't explain?" The boy holds a wand, and is surprised at the reaction. From the dialogue we find out the boy's name is Harry, and he had no idea he was a wizard, or even knew what they were. The Warner Bros. logo fades up, with some more theme music. The dialogue segues nicely with Harry reading his Hogwarts School of Witchcraft and Wizardry acceptance letter. This moves onto an instructor introducing the students to the school. Everything up to this point flows well, and provides its own context. After this is where the scenes become more random. Trailers like these sometimes feel to me more like a means to deliver screenshots. There's a scene about how the staircases change. This shot is in keeping with introducing the school, but since this line of thinking is abandoned in the next scene, it feels unmotivated. 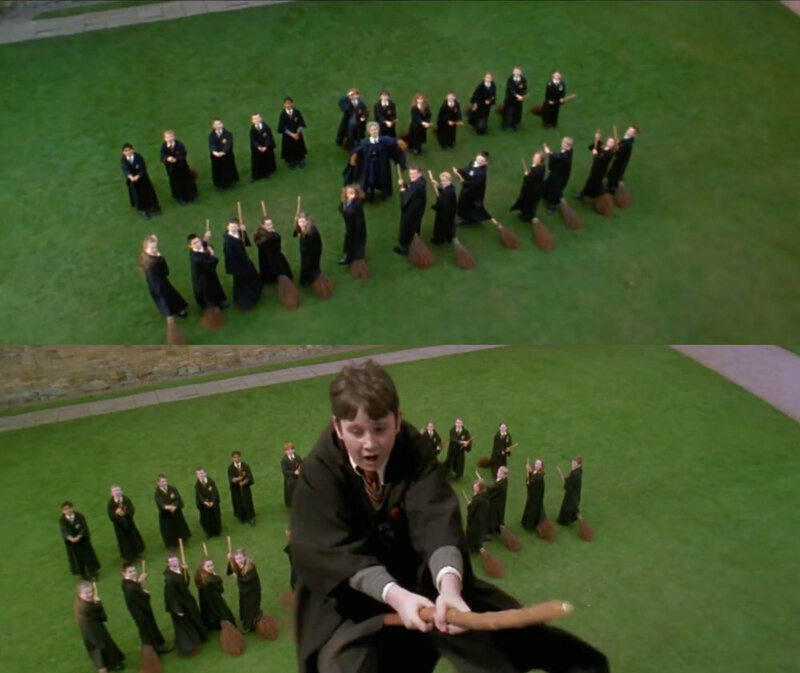 Harry receives a broom from an owl, we didn't need to see Harry receive his broom to understand the trailer's story, but it's a big moment from the books, so it gets included. Then we're on to the flying lessons; this scene is a bit disjointed from previous scenes, but it could be starting a montage of what they're going to be doing in school. Then a kid loses control of his broom. From the dialogue we know his last name is Longbottom, but otherwise this scene has no connection to the main story, why do we care about this one kid? What does this shot contribute to the trailer? In the teaser it was just a camera move, in the trailer it's fully composited. Then we see a kid asking Harry about a scar, which he then shows to him. We don't know why this scar is important, just that for some reason other people know he has it. This doesn't connect to anything we've seen so far; at this point we don't even know that Harry is exceptional in any way, except being the main character of the film. Then Alan Rickman in a very unimpressed tone of voice refers to a Mr. Potter, which we find out is Harry's last name. For some reason he's a celebrity of sorts. This scene would flow better if it was swapped with the previous one, because establishing Harry Potter as a celebrity would contextualize the kid knowing he had his scar. When I'm editing dialogue for a trailer I aim to either combine lines so that it sounds like natural back and forth dialogue or something that sounds like one unbroken thought (even if it's said by multiple characters). "Mr. Potter, our new celebrity... do you really have that scar?" Then an authoritative looking old man talks about how the dark forest is strictly forbidden; we see Harry and a blond boy inside the forest. This line would've fit better before the flying lesson because it continues the school orientation line of thought. During this section about the dark forest we see a quick cut of Harry holding some sort of gold ball with wings. This doesn't apparently connect to the dialogue about the forest in any way, so why are they showing it? Then the man says magic isn't to be used between classes in the corridors. This is juxtaposed with a long-haired girl using magic, presumably in the forbidden area. The old man says the 3rd floor corridor is out of bounds to people who don't wish to die, and of course we see Harry in what we assume is that corridor. At this point, we're 2/3rds of the way through the trailer, and we still don't know anything about the plot. Another thing people wanted to see, but has no context in this trailer. A man screams about a troll in the dungeon; we get shots of Harry and his friends hiding, and a troll wielding a massive club, but as soon as this shot is done, we never come back to it. The bearded man from the opening tells Harry that not all wizards are good. This is cut with Alan Rickman, so we assume he's bad. Is he the villain of the story? This is the only mention of this, because in the next shot we move onto the long-haired girl talking about how she's going to bed before Harry and his friend do anything to get them killed or expelled. This is intercut with what looks like a giant chess board, which makes us assume that's a dangerous thing. Then we're done with most of the dialogue, the music flourishes a touch, and we're into a montage. We see a giant three-headed dog, a flying vehicle, a stone horse shattering, and the blond boy on a broom throwing something. Then another old man says they can expect great things from Harry. So what did we learn from this full trailer? Harry Potter is a special wizard. Harry is attending the Hogwarts School of Witchcraft and Wizardry with hundreds of other kids. They learn to fly at the school. Harry is a celebrity, and everyone knows about his scar. There are more details if you want to read in between the lines, but these are the highlights given to us via the dialogue. If you were to ask someone totally unfamiliar with Harry Potter to summarize the first film based off this trailer, that's all they would get. Fans of the book will recognize this is from Harry's invisibility cloak, but it probably doesn't register at all for non-fans. That scene where Neville Longbottom loses control of his boom and Hermione stops him from ratting them out. Pretty much a laundry list of opportunities to say "Did you see this!?" They would probably finish watching this trailer dying to see more. Most of these scenes don't flow into each other because the goal is not to tell a story, but to show the built-in audience what they're dying to see. Some shots like the golden snitch aren't even related to the dialogue, but I guarantee it was a popular shot, because a majority of the fans were curious what it looked like. This trailer probably could've just been Alan Rickman saying "Mr. Potter..."
What did you notice about the music? For the vast majority of the trailer, the music is never front row center. The beginning and end are the exception; for the bulk of the trailer, the music isn't much more than background noise, and at worst is barely audible. There's none of the flourish typical of music editing in trailers. You can really tell because virtually none of the scene transitions are motivated by the music or vice versa. Bits of sound effects or musical accents between lines of dialogue are kind of like a shot of adrenaline to keep the audience engaged. With virtually none of that in this trailer, the pace drags, especially if you're not the built-in audience this trailer is catering to. I'm guessing that the editor was required to use only John Williams' score; his scores are not generally the trailer-friendly sort of music which contain frequent accents. His themes are excellent, but the music in between those iconic themes work much better in their respective films. So was including the John Williams music even a better choice if they couldn't cut it to the story, and ended up mixing it so low? This trailer also doesn't set up any antagonist or "problem" except this cartoony Troll. Also, the editing is mostly lines of dialogue one after another with no sound effects or music beat punctuating them. Good music editing is what will really make a trailer exciting, but an interesting story can compensate for the music. But there's no through line for this trailer other than Harry Potter being at a Witchcraft and Wizardry school. A broad view is good to set up a trailer, but not diving into the plot makes the whole thing fall flat for me. I think what happened was that the editor had a laundry list of "You MUST show this...", and while some of them tenuously fit together as a story, they were too scattershot to do much more than montage in as logical an order as possible. This could've been the result of higher up decisions makers, and focus group tests. I can easily imagine a focus group for the first Harry Potter trailers asking: "Where was the shot of...?" The number of completed visual effects could also have limited the available shots. For example, in the first Harry Potter teaser there's a crane shot of the students during their flying lesson; in this trailer that shot is revealed to be Neville Longbottom losing control of his broom. Something I want to clarify though is that this is critique of the full trailer. Teasers operate on a very different form of storytelling where the goal is to give a sampling of a wide spectrum of shots. The teaser for Harry Potter and the Sorcerer's Stone is great because it does precisely this, and puts John Williams' music front row center. The teaser is saying "Look at this, oh and look at this!" Take a look! So there's a glimpse into the potential reasons I might not like a trailer. Ultimately, this perspective of mine probably doesn't matter all that much, because this was still a very successful trailer. It was smart to include all those iconic scenes to get the fans hyped up, so it performed its task. I just know that the full trailer is not one that I ever feel the need to revisit, because as a trailer telling a story, it doesn't resonate with me at all. I think most people will still judge a trailer on its content, rather than its construction, but if hearing my perspective gives you more appreciation for trailers that successfully balance hype with good editing, then writing out my thoughts will all be worth it!